Consider this to be written in pencil, because it’s going to change. More than $1.6 billion and disagreements on how much Texas should spend on public education and Medicaid separate the budgets proposed by the House and Senate. The Senate budget proposal, passed 29-2 by the upper chamber last week, spends $195.5 billion, a 2.9 percent increase from the current two-year budget. The House budget, which is scheduled for a vote on the House floor on April 4, spends $193.8 billion, a 2.1 percent increase. 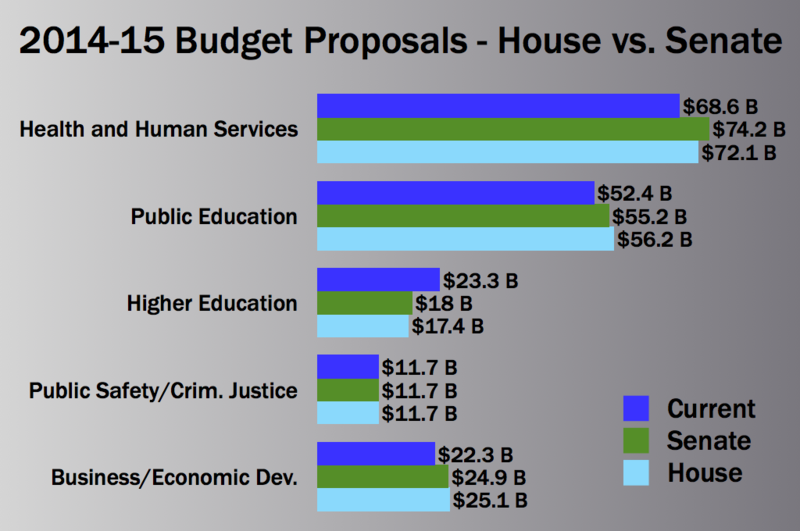 While the House budget is smaller, it spends nearly $1 billion more on public education. The Senate plan spends $604 million more on higher education. The Senate also invests $2.1 billion more in health and human services. A large portion of that extra spending, $974.5 million, covers projected growth in costs associated with Medicaid such as more Texans enrolling in the program and general medical cost inflation. The House budget does not address those costs. “Our bill does not include cost growth, does not include rate increases, and we need to address those things,” state Rep. Jim Pitts, R-Waxahachie and the chamber’s chief budget writer, said last week. Assuming the House proposal passes that chamber, members from both the House and Senate will meet in conference committee to resolve differences between the two plans. The final product is likely to be larger than what either side has proposed. Neither budget addresses large shortfalls in transportation or water funding, two issues many lawmakers have discussed tackling this session. Legislators have also said they are considering additional spending on tax reform and further reversing last session’s public education cuts. Lawmakers are also waiting on an updated revenue projection from Comptroller Susan Combs. If she tells them there is more revenue available than what she estimated in January, lawmakers may feel more comfortable spending more. As the story notes, don’t be fooled by the graphic for higher education. There was an accounting change that makes it look like there was a cut, but in actuality there’s more money being appropriated, so that’s good. The budget still isn’t where it needs to be to account for growth and need, and we suffered needlessly for two years thanks to Comptroller Combs’ lousy revenue forecast, but things are better and that’s no doubt why this session has been less contentious so far. I do believe the House will account for Medicaid and the Senate will bump up its public education spending, with both being abetted by a higher revenue projection for the biennium. Beyond that, watch for the usual shenanigans in the amendment and rider process.